Extra added security to your valuable data (Content & Images). Protects your content & images from being copied. Keep your Contents and Images safe from being copied. Disables keyboard shortcut key "Ctrl + A"
So it will add "Triple Layers" of protections from data being copied. Still it's not 100% solution to protect data. Actually there is no 100% solution of that. Techie can copy in many ways. 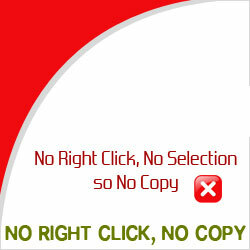 However, even techie may leave the site, and go for another site to copy contents. As it will need some time to break these protections. So it's not a 100% solution, but it's the "Only and Best solution". Opera(Ctrl + A and Text Selection) - No Support. Buy once and use for unlimited domains.